Eyewitness News investigates the snitch scandal that's led to at least one confessed killer walking free. SANTA ANA, Calif. (KABC) -- Oct. 12, 2011 is a dark day in Orange County history. Scott Dekraai, a former tugboat captain, stormed a Seal Beach hair salon and opened fire. Minutes later, eight people were dead and one critically injured. The massacre remains the deadliest mass killing in Orange County history. 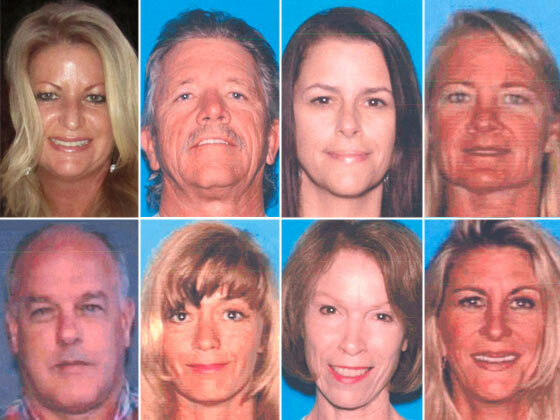 Eight victims shown clockwise from top left: Michelle Fournier, Randy Fannin, Laura Webb Elody, Michele Fast, Christy Wilson, Lucia Kondas, Victoria Buzzo and David Caouette. The murders and their aftermath have wrought unimaginable pain on family members of the victims. Four years later, the legal case against Dekraai, who pleaded guilty last year, is in disarray. The entire Orange County District Attorney's Office has been kicked off the death penalty phase of Dekraai's case. Orange County sheriff's deputies have been accused of lying under oath. There are calls from one of the most respected legal minds in the nation and the New York Times for the U.S. Department of Justice to investigate. How did Dekraai's crimes lead to this? It all comes down to whether or not prosecutors and sheriff's deputies broke the law in the pursuit of convictions. Critics say the most powerful law enforcement entities in Orange County cheated the system, pursuing a win-at-all costs legal strategy for decades, at the expense of not just Dekraai's constitutional rights, but potentially scores of other defendants. Scott Dekraai had already confessed to the murders to police when he found himself in an Orange County Jail cell next door to prolific jailhouse snitch Fernando Perez. Perez, a former leader in the Mexican Mafia and third-striker facing possible life in prison, turned informant in 2010 and quickly racked up confession after confession from a series of suspects, all of whom wound up in a jail cell right next to Perez. Perez may have sensed an opportunity when Dekraai started talking about his crimes. He knew that if Dekraai gave up information police and prosecutors wanted, Perez might be able to leverage that into a more lenient sentence for himself. "They didn't need to put an informant in that cell next to him," said Paul Wilson who lost his wife of 26 years in Dekraai's rampage and is outraged by delays in the case and what he calls "absolute crimes" by elected officials. "They're in cover-up mode," Wilson tells Eyewitness News. It's perfectly legal for law enforcement to use jailhouse informants. But it is illegal for law enforcement to deliberately deploy informants to coax incriminating statements from a defendant who's already been charged and has the constitutional right to an attorney and to remain silent. Orange County Superior Court Judge Thomas Goethals determined that Perez was acting on behalf of law enforcement when he secured Dekraai's confession, which was recorded by a wire set up by the Orange County Sheriff's Department at the request of Seal Beach police and prosecutors with the Orange County District Attorney's Office. "When the Orange County D.A. 's Office and the Sheriff's Department structure the use of jailhouse informants to gain information from inmates, that violates the constitution," said Erwin Chemerinsky, Dean of the U.C.I Law School. Chemerinsky is calling on the U.S. Department of Justice to investigate allegations of systemic misconduct, allegations that have spread to numerous other cases dating back decades. Defense attorneys for other suspects are now using those allegations to argue for new trials and negotiate plea deals. One confessed killer has already walked free; two attempted murder defendants got plea deals; other convicted murder defendants are asking for new trials, all based on the alleged misuse of jailhouse informants and hidden evidence about those informants. "What we're really talking about is - how many people's constitutional rights were violated? How many people were convicted in an unconstitutional manner?" Chemerinsky tells Eyewitness News. "We don't have the answers to those questions, and we must!" The D.A. 's office and the Sheriff's Department say it was a coincidence that Dekraai, the highest-profile murder suspect in Orange County history, landed in a cell right next to the prized informant. They say Perez was told he could not ask Dekraai questions about his crimes -- that he could only act as a "listening post." "There's no evidence of a conspiracy. There's no evidence of intentional violations...there's none of that," said Orange County District Attorney Tony Rackauckas. Rackauckas admits his office made a handful of mistakes in Dekraai and other cases by not turning over evidence related to jailhouse informants. But he says those are a "drop in the bucket" among the 20,000 felony cases his office handles each year. Rackauckas tells Eyewitness News that the identity of informants needs to be protected for the informants' own safety and insists some cases would never be solved without the use of snitches. "That's why it's so often said -- if there's an evil plot hatched in hell, you're not going to have angels as witnesses," said Rackauckas. The fallout from the Dekraai investigation into jailhouse informants and hidden evidence is staggering. In March, Judge Thomas Goethals recused all 250 of the D.A. 's attorneys from the death penalty phase of Dekraai's case, citing prosecutors' "chronic failure" to turn over exculpatory evidence to the defense. "As chief law enforcement officer in this county the District Attorney is responsible for the actions of his agents. In this case the evidence demonstrates that some of those agents have habitually ignored the law over an extended period of time to the detriment of this defendant," Goethals wrote in his ruling. The judge also singled out OCSD Deputies Seth Tunstall and Ben Garcia for having "either intentionally lied of willfully withheld material evidence" from the court. 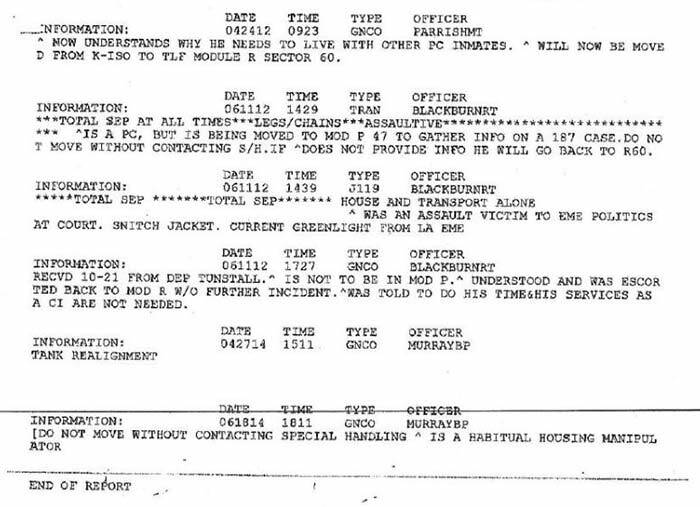 Much of the withheld evidence at issue comes from a trove of jailhouse records known as "TRED." In his ruling, Judge Goethals referred to TRED as a "computer data base built and maintained by the Orange County Sheriff," that remained secret "despite numerous specific discovery orders issued by this court." "There's no secret about it. Certainly, the District Attorney's office has known about it for years," Orange County Sheriff Sandra Hutchens tells Eyewitness News. District Attorney Tony Rackauckas says that's not true, and that his office had only seen TRED records in one case before the Dekraai investigation brought them to light. Eyewitness News anchor Marc Brown asked Rackauckas about Hutchens' claim that the D.A. 's Office had known about the secret records for years. "I wasn't there for your conversation with the Sheriff," Rackauckas said. "The truth of the matter is we have not been privy to those records in our cases." TRED records are key to this controversy because they can show who moved an inmate and why. For instance, was an informant deliberately placed next to a suspect to elicit incriminating information? On the witness stand at a hearing for Dekraai last year, Orange County "Special Handling" Deputies Seth Tunstall and Ben Garcia denied the jails have an informant program and despite repeated questions, never brought up the existence of the then still-secret TRED records. Sheriff Hutchens does not believe the deputies intended to mislead the judge, but says she can't question the deputies until a criminal investigation being conducted by the California Attorney General's Office is complete. "It's information in the jail world that they want to keep secret to protect the security of the facility, to protect the inmates and I really think he was unsure about what he could or couldn't say at that point," said Sheriff Hutchens. Deputy Seth Tunstall's claim that the jail has no informant program and that as a "Special Handling" deputy he did not handle informants came under scrutiny after Dekraai's public defender, Scott Sanders, unearthed a 2013 sworn affidavit by Tunstall in another case. In that affidavit, Tunstall declares under oath that as part of his duties with the Sheriff's Department, he has "cultivated, interviewed and supervised numerous confidential informants." When confronted with the seeming contradiction, Tunstall, a veteran deputy with doctorate in psychology, backed off from his previous sworn statement. "I guess I put the wrong word in there," Tunstall testified. Tunstall, Garcia and two other "Special Handling" deputies are now refusing to testify, and pleaded the fifth at a hearing related to informant issues earlier this month. That hearing will determine if convicted killer Eric Ortiz should get a new trial based on allegedly hidden evidence connected to yet another jailhouse informant. One by one, deputies Seth Tunstall, Ben Garcia, William Grover and Bryan Larson took the witness stand at the Central Justice Center in Santa Ana with their defense attorneys in tow. The deputies each invoked their Fifth Amendment right against self-incrimination, refusing to answer even basic questions like where they work. When questioned by Judge Richard King about what potential crimes their testimony could reveal, defense attorneys for the deputies said it could expose them to possible charges of perjury, withholding evidence and conspiracy to obstruct justice. Pleading the fifth is not an admission of any wrongdoing. Attorneys for the deputies say they believe the criminal investigation will ultimately prove their innocence and invoking the right to remain silent is "the right call" until that investigation is concluded. The Sheriff's Department, meanwhile, has stepped up training and put in place new policies on the use of confidential informants. Alexandra Natapoff is a professor at the Loyola Law School and a nationally recognized expert on the use of informants. Natapoff says the Dekraai investigation raises serious questions about whether Orange County law enforcement has been playing by the rules with scores of other defendants. "It's a terrible blow to the integrity of the criminal justice system itself when you have judges recusing entire DA's offices," said Natapoff. "When you have an entire public looking at the DA's office and Sheriff's Department and realizing - they lied under oath, they hid records for decades, they disobeyed the constitution." Fernando Perez, the jailhouse informant at issue in Dekraai's case, has admitted he lied on the witness stand at his own trial. His motivation to work as an informant was made clear by his repeated statements to law enforcement that he would "do anything" to avoid a possible life sentence. In one handwritten note to an OCSD deputy, Perez writes, "I love this little job I got." In another, he declares, "I believe my mission is done," after obtaining a confession from a murder suspect. Perez's apparent skill at eliciting damning information from his jailhouse neighbors is so impressive, he once delivered two confessions in one day as murder and attempted murder suspects were rotated into and out of the jail cell next to him. A coincidence, the Sheriff's Department says, in a jail that holds 5,000 inmates. Eyewitness News asked Sheriff Hutchens how random it could be if time and time again, Perez wound up in a cell next to inmates who so readily confessed. "I can't...I don't know how to answer that question," said Sheriff Hutchens. Judge Goethals found that Perez was "a professional informant working at the direction of law enforcement," when he engaged in conversation with Dekraai. That's a violation of established law known as "Massiah", which prohibits law enforcement or their agents from eliciting incriminating statements from charged suspects. The D.A. 's Office ultimately agreed to exclude the confession Perez got from Dekraai in the mass murderer's death penalty phase. Eyewitness News has obtained an "Informant Assistance" memo written by District Attorney Investigator Robert Erickson less than a month after Perez secured a confession from Dekraai. In it, Erickson explains to the Deputy District Attorney handling Perez's case that the informant has provided facts and intelligence that will "likely greatly enhance the prosecution of Dekraai." Erickson tells Deputy D.A. Erik Petersen that he's providing the memo for his "consideration," and that it has not been discovered to Dekraai's defense. That memo was not turned over to Dekraai's defense team for nearly two years. Prosecutors for Dekraai later claimed they never saw the memo because they forgot to open an email attachment. Eyewitness News asked Rackauckas about the centralized database his office keeps on informants like Perez. It's known as the OC Informant Index. "Our policy is to always turn over Brady information," Rackauckas said, referring the law that requires prosecutors to turn over evidence that could be helpful to defendants. "We don't withhold that, we turn that over to the defense." Eyewitness News then asked about a specific entry in that index about informant Fernando Perez. It states: "PEREZ WAS TERMINATED AS A CI (confidential informant). DO NOT USE AS A CI." That entry could be used by defense attorneys to cast doubt upon the credibility of Perez, but it was not turned over to defense attorneys. Why not? "Well, I told you the problem with that, at least at the time, was that to release that would be to release the identity and would be put the informant at risk," replied Rackauckas. "So, in that one area, yeah, that was withheld." It's not just TRED records and OC Informant Index entries that were allegedly withheld. Defense attorneys for multiple defendants say handwritten notes by informants, including Perez, were largely hidden from them, judges and juries for years. Many of the notes were written to "Special Handling" deputies like Ben Garcia. Defense attorneys argue that the notes contain potentially exculpatory information and suggest the informants are actively engaged in building cases from behind bars. Informant Perez titles his many of notes "Operation Daylight," a nod to his admitted hope that his hard work behind bars will earn him a more lenient sentence, even without an explicit promise from prosecutors. "It's the worst kept secret in the criminal word," said Professor Natapoff. "Everyone in the criminal justice system knows that a deal will be forthcoming if an inmate provides information." Perez, who was convicted on firearms charges in 2009, is still waiting to find out what, in any, "consideration" in sentencing he'll receive for his work as an informant. While the D.A. recommended life in prison for Perez after his initial conviction, they took no position at his most recent hearing this summer. Perez has also done informant work for the FBI and one of their agents showed up at his sentencing hearing to tell the judge that Perez's work had "led to the incarceration of 100 or more people." Perez's attorney, Richard Curran, wants Perez to be released promptly on credit for time served. Curran asked the judge to consider a deputy sheriff's claim that "eleven persons had been saved from being stabbed or killed by information provided by Mr. Perez." Curran says Perez has "thrown off the lifestyle that led to his previous offenses," obtained a GED certificate, and while in custody "has participated in a dog training program for bomb sniffing dogs." Sentencing for Perez was delayed again until December. The plea deals aren't just for informants. Prosecutors have dropped or pleaded down cases against confessed killers Isaac Palacios and Leonel Vega. Two attempted murder defendants have also seen their charges reduced or dropped. Two more convicted murderers, Eric Ortiz and Henry Rodriguez, are now pushing for new trials, all based on issues related to the alleged misuse of jailhouse informants. Professor Natapoff says those cases and others are now at risk. "Because the malfeasance spread so far within the D.A. 's Office and within the Sheriff's Department, it really has called into question the fabric, the integrity, of really, the entire law enforcement process in Orange County," said Natapoff. Orange County District Attorney Tony Rackauckas says an internal investigation conducted by his own staff found that "mistakes" were made, but they were not intentional. Prosecutors and investigators were interviewed as part of that internal investigation, but Rackauckas says no notes were taken, no interviews were recorded, and no report was generated for the public to view. "Basically, we made certain findings that there had been some mistakes made. There were some discovery violations and this is what we have to act on," Rackauckas told Eyewitness News. His office has stepped up training for prosecutors on turning over Brady material to defendants. Rackauckas says his office also created a committee that must approve the use of informants in felony cases. In July, Rackauckas announced the creation of a new, "independent, external" committee to look at the use of jailhouse informants. But some critics question the independence of a committee whose members were primarily handpicked by Rackauckas himself. Rackauckas tells Eyewitness News that he selected four of the five-committee members. The fifth, Professor Laurie Levenson of the Loyola Law School, was selected by the committee members to serve as an advisor. Confessed mass murderer Scott Dekraai is the face of the scandal that's rocked Orange County law enforcement. And some may wonder why it matters if the constitutional rights of a confessed killer were violated? "We can't just write this off as bad guys getting bad guys," said Professor Natapoff. "The criminal justice system is not just for the Scott Dekraais of this world, it's for all of us!" In a strange turn of events, some family members of Dekraai's victims agree and now find themselves more aligned with Dekraai's public defender. They want the District Attorney's Office to take the death penalty off the table for Dekraai, to bring some closure to four years of courtroom hell. "It is so physically and mentally draining to have to walk into that courtroom and look at that guy, to sit 10-15 feet away from that guy, that coward," said Paul Wilson, husband of Dekraai victim Christy Wilson. Wilson believes Dekraai deserves to be executed for his crimes, but has no faith in the death penalty process as it currently stands in California where no prisoner has been put to death since 2006. "Why are we doing this? He's admitted he's guilty," said Paul Wilson. "He knows he's going to jail for the rest of his life. Why are we going to court for another four years?" Death penalty proceedings for Dekraai are on hold for now. Judge Goethals' recusal of the D.A. 's office sent the case to the California Attorney General's Office. That ruling is being appealed. Rackauckas says if the recusal is overturned, his office will continue to pursue the death penalty. He questions who, if not Dekraai, deserves the ultimate penalty of death? "To give up the death penalty in that case would be to throw in the towel altogether, and frankly I'm not willing to do that," Rackauckas told Eyewitness News. Beth Webb lost her sister to Dekraai's rampage. Laura Webb Elody was a newlywed, whose maid of honor, fellow hairstylist Victoria Buzzo, was also killed in the mass murder. "She was a really, really good soul. She had a smile that came from the inside," said Webb. Webb says she has pleaded for Tony Rackauckas to accept Dekraai's offer to serve life in prison without the possibility of parole if he is spared from the death penalty. "For Tony Rackauckas, it's all about saying 'I'm tough on crime, I'm not going to be the one that lets the biggest mass murderer go without the death penalty," said Webb. Webb does not forgive Dekraai for his crimes, but does not want to see him executed. "I...don't want to be like him. So I don't wish for his death," Webb said through her tears." Got a tip? Email Investigative Producer Lisa.Bartley@abc.com. VIDEO: Did Orange County law enforcement break law by using jailhouse informants? Did Orange County law enforcement break law by using jailhouse informants? Did Orange County law enforcement agencies conspire to break the law? That's the allegation at the root of a scandal that's seen violent criminals set free. Did OC law enforcement break law by using jailhouse informants?